Discussion in 'Outerwear' started by carl_c, Dec 6, 2018. It a B3 made with B6 lampskin. It feels soft no need to break in (much softer and a bit lighter than my schott p613s), the shearling smells good. The only thing that I'm not 100% satisfied is the fit, the body and sleeve length are perfect, but it could be a little slimmer, especially the upper arm. Here are some photos of the fit, is it a little too big or it's how a B3 supposed to fit? It looks like a good fit to me, they’re meant to fit big so you can layer if you need to. The shoulder tabs were originally meant to have military epaulets attached and then they’d be stitched down, but as far as I know they weren’t used too often. After a while you won’t notice them. Do you mean that is made with the shorter B6 fleece? Strange it looks like longer fleece than my Aero B6 more like a regular B3 . Are you sure that you received just what you ordered? I think the fit looks like it should for a B3. Yes, it's made of 15mm lampskin, at least that's what I requested and it's printed on the recipet. It looks pretty nice! 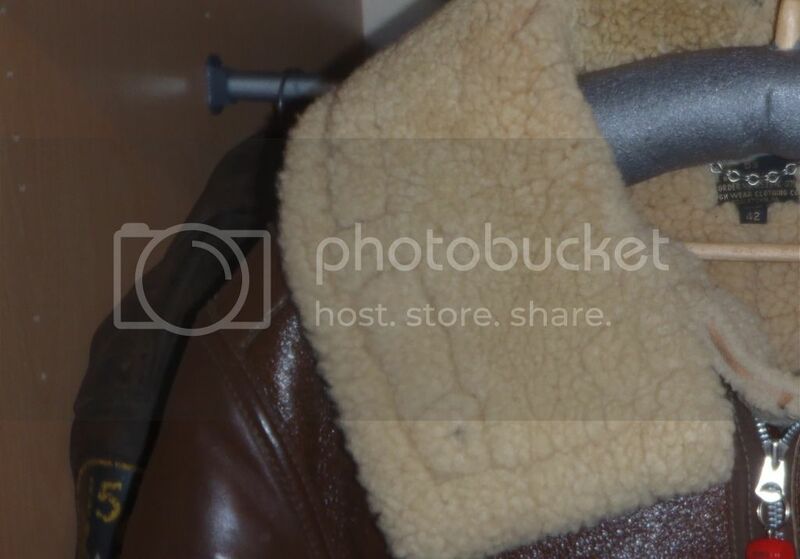 I've never noticed those tabs either, but I avoid these threads because they make me want a sheepskin jacket! I'd probably take the scissors to those tabs. Lol. Looks good to me. The top of the arms are big on my B-3s as well, especially on the redskin, but I think that's how they're supposed to be, certainly helps with movement. As for the leather tabs, yes they will flatten with wear, molding them down when wet helps, you'll soon not notice them. As others have said the arms are meant to be big due to the layering of a uniform underneath. carl_c, nick123 and Dav like this. Jacket came out looking good but could be little trim. Too bulky for my taste but I understand people have different preferences. ProteinNerd, sweetfights, Sloan1874 and 1 other person like this. Agreed. This looks one size too big to me. ProteinNerd and sweetfights like this. From what little I know about the B-3, this one looks like a good fit. It needs to be large enough to comfortably fit a sweater underneath, at least that is the way I would like it. Upper sleeves look OK to me, but I think I would sew down those tabs. Looks like you are about to take off using the small wings. carl_c and rocketeer like this. The back looks a bit roomy for my taste. Having owned one of Aero's heavy fleece jackets, you're not going to need to layer too much. I'd have gone down a size, but ymmv. bn1966 and sweetfights like this. NO I disagree, I think it's a PERFECT FLAWLESS fit on you!!! awesome jacket!!! Really good cut man! You're not swimming in it, If it's a bit roomy you Layer up and wear a nice military Scarf. Once it breaks in you'll have a lot more room though I'm sure when the fleece packs down a bit more you know? but I think you can live with it as-is...looks Really legit on you. When are you planning to get old and pack on a few extra pounds, you'll be glad you got a little extra space in that Jacket, It will out live you..you know? carl_c, Jejupe and nick123 like this. If they can trim it down you should definitely do it man. Personally will make a huge difference. Winter jacket I get but this looks way too big for you. At least one size too big. Other wise dam good jacket. If it's not too troublesome I would like to have it modified, but if it is, I'm OK with the roomy fit. The length is perfect, just a bit roomy. I'll see if anyone in fedora lounge has ever modified his jacket and see what I can do.